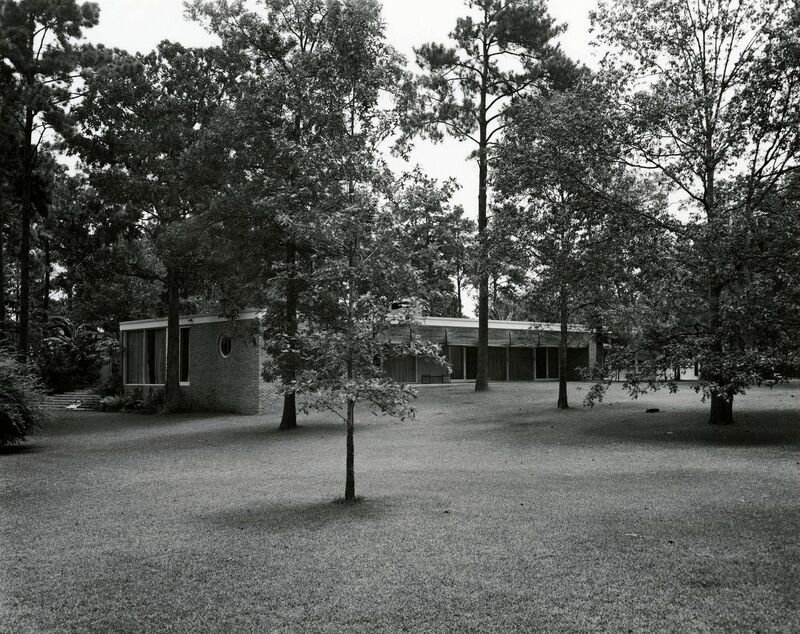 “The 1950 Mary Wood and Hugo V. Neuhaus, Jr., House is a one-story, steel and wood-framed, flat-roofed, glass-and-brick-walled modem pavilion that reflects the influence of Ludwig Mies van der Robe and Philip Johnson on the architectural development of mid-twentieth-century Houston, Harris County, Texas. 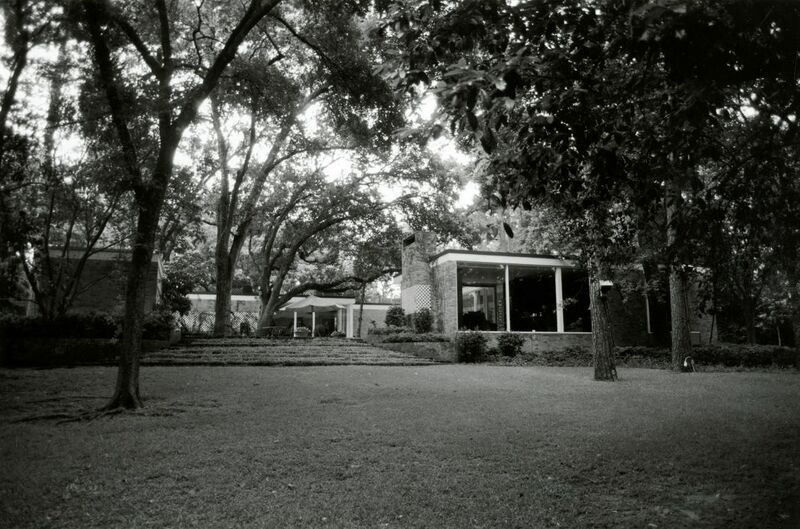 The house is based on an H-shaped plan incorporating a pair of garden courtyards. 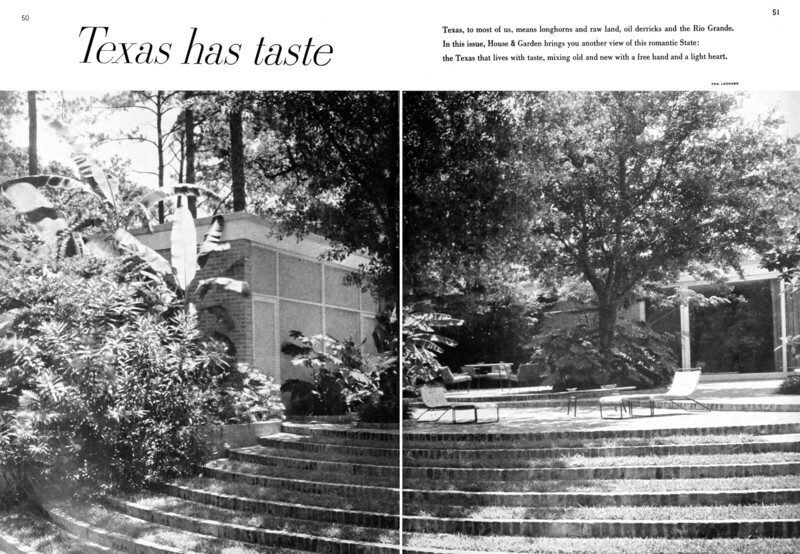 The east (entrance) face of the house is oriented toward Kirby Drive, a parkway thoroughfare drive that links River Oaks to downtown Houston; the south elevation of the house faces Lazy Lane, the single street that traverses the Homewoods subdivision. Lazy Lane is a broad street that divides around landscaped median islands. Massed evergreen broad leaf trees and hedges screen most house sites from the street. 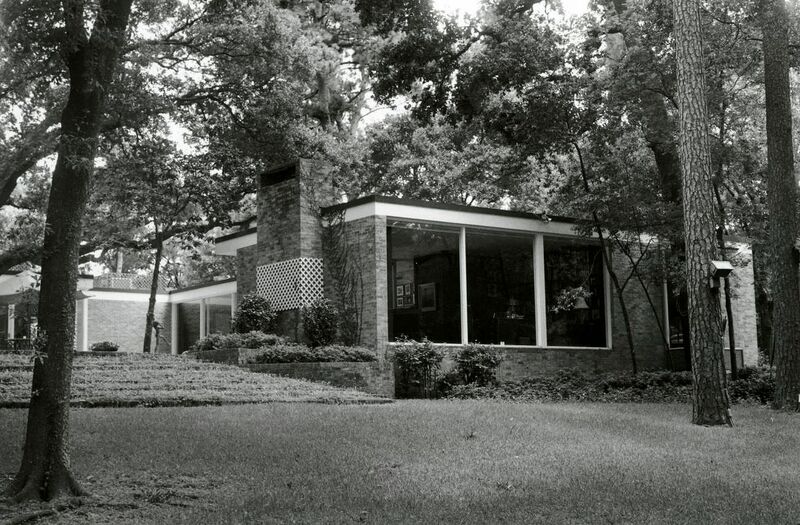 The walls of the Neuhaus House are planes of smudge-faced brick, laid up in a mixed blend of salmon, orange, and buff brick, alternating with planes of glass, either horizontal ribbons of wood-framed casement windows above stucco-faced spandrels or floor-to-ceiling wall planes of plate glass, with all walls capped by a horizontally continuous, white-painted wood fascia. The north elevation is five bays wide. 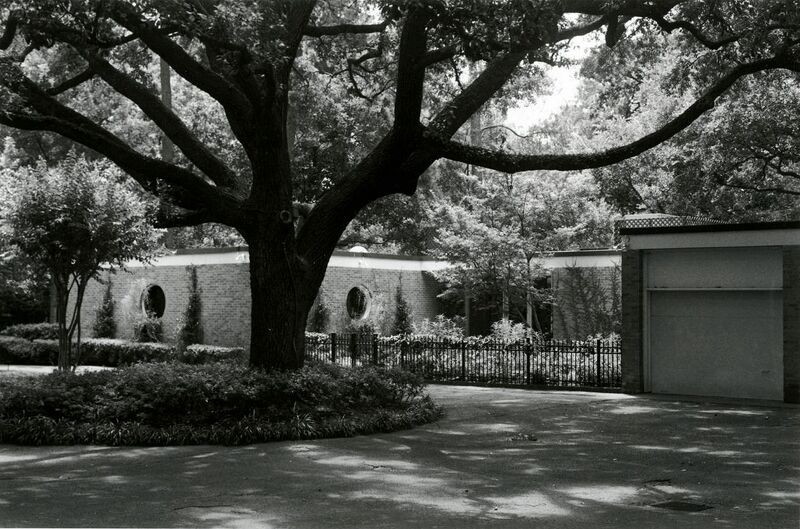 The first, eastern, bay, containing the garage, repeats the circular window set into a brick wall as seen on the front elevation. The second bay, an in-fill addition from the early 2000s, is a glass-fronted pavilion with clerestory windows that project above the roofline of the original house. The third bay has a variation of the A-B-A window type with a narrow pane and large fixed plate glass pane (A-8 pattern) followed by a narrow brick colunm, then a wood-framed glass door with the mirror image window grouping (door-B-A). 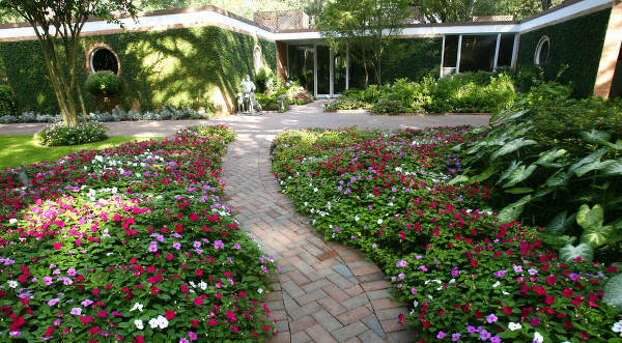 The fourth bay is a recessed brick garden wall with a heavy wooden door that appears to be original. The door is constructed of solid vertical wood blocks with horizontal wood bands at the top and bottom. The fifth bay is the pool bathhouse that has been remodeled into an exercise and guest house. The south elevation, the house’s longest, consists of three bays. The westernmost bay contains two asymmetrically placed circular windows in a brick field. The intermediate bay is a deeply recessed glass window wall-a combination of doors and floor-to-ceiling fixed panes. The third bay contains three window groupings: the first a door then plate glass window followed by narrow window with and operable lower casement (door-B-A); the second bay has the A-B-A pattern; and the third bay is the mirror image of the first (A-B-door). The stucco band beneath these windows has been painted to match the brick. One of the most important architects of 1950s Modernist homes in Palm Springs will have a street renamed in his honor on the site where his designs first broke ground 60 years ago. Architect William Krisel will be recognized in an official Modernism Week event (http://www.modernismweek.com/event/details/street-dedication/) at 10:00AM Tuesday, February 16. The public is invited to the free one-hour ceremony to be part of the rechristening of Arquilla Road as William Krisel Way at its intersection with East Twin Palms Drive. In the most ambitious project ever undertaken by a single Palm Springs neighborhood, the Twin Palms Neighborhood Organization is mounting this event, for which up to 500 attendees are budgeted. 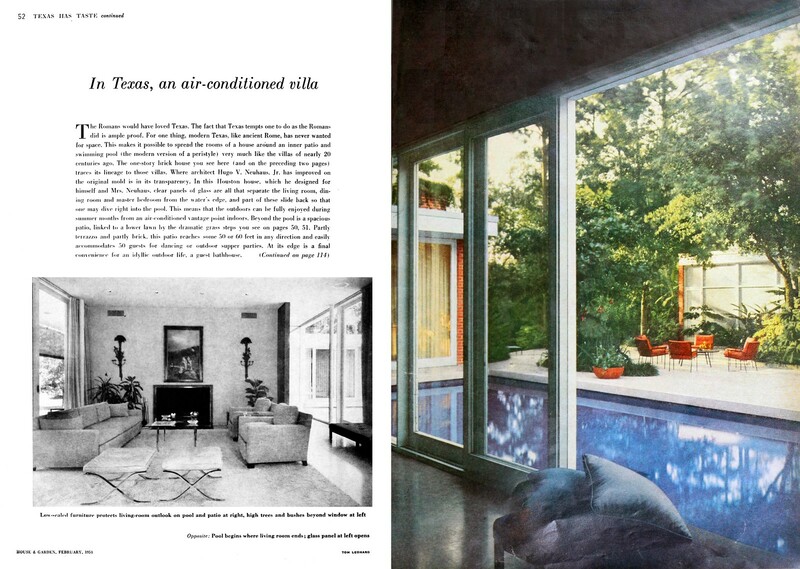 With their iconic butterfly roofs, clerestory windows, exposed concrete block, open carports, and breezeways, Krisel’s designs are hallmarks of the Modernist aesthetic. 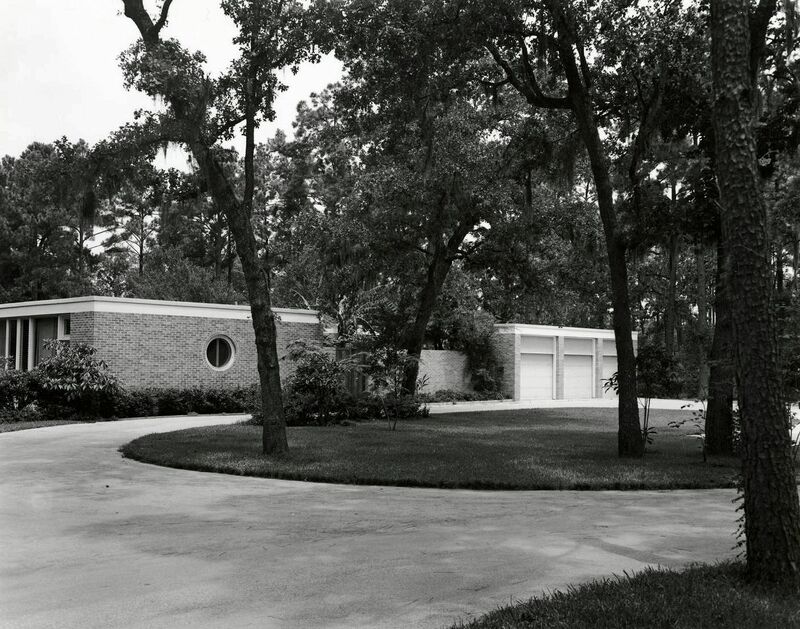 His importance to the City is derived from his pioneering designs that combined the economies of tract homes with the look of custom residences. This made Palm Springs affordable to the middle class and triggered a population boom that lasts to this day. 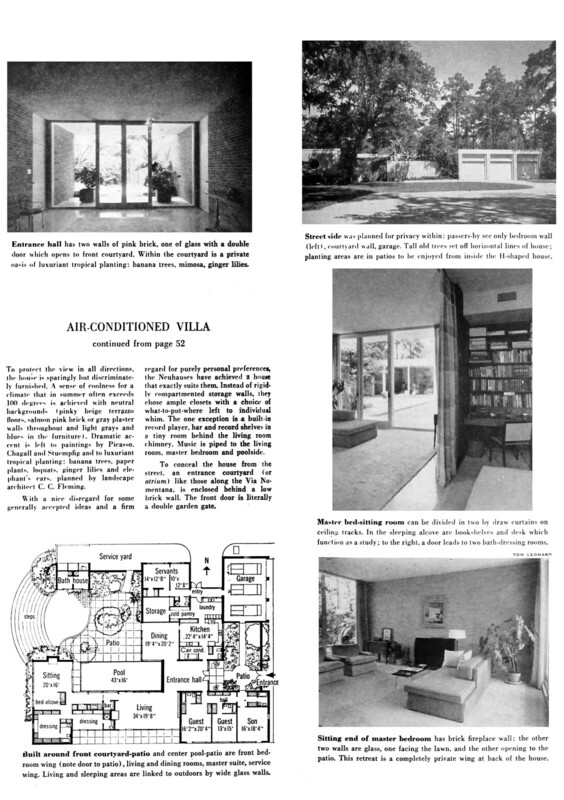 Twin Palms was the first completed Krisel neighborhood in the City and was its first truly modern housing tract. More than 50 VIPs have confirmed their attendance for the ceremony, including the City Manager and entire City Council. Palm Springs Mayor Rob Moon will proclaim February 16 to be “William Krisel Day.” Other confirmed VIPs include the Executive Director and the Architectural Curator of the Palm Springs Art Museum, several commissioners from the City’s historic and architectural Boards and Committees, the Director of the PS Historical Society, and Krisel biographers and filmmakers. Mr. Krisel, 91, lives in Beverly Hills but his health precludes his attendance. A video of his acceptance has been recorded for screening that morning.